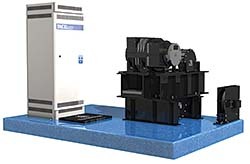 Geared to Gearless modernization package allows existing geared elevators to be upgraded gearless elevator technology. High-efficiency motor is directly integrated with the drive sheave, eliminating the geared assembly and achieving up to 95 percent machine efficiency, according to the company. Includes regenerative drive system that feeds waste energy back into the building's power grid.